Preheat oven to 150°C. Melt golden syrup and butter together. 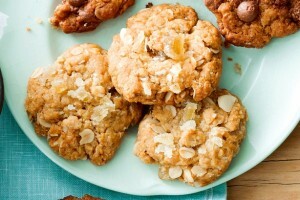 Mix oats, macadamia nuts, flour, sugar and coconut together. Mix bicarbonate of soda with boiling water and add to melted butter and syrup. Add to the dry ingredients. Mix well. Roll tablespoons of mixture into balls and place on greased tray, allowing room for spreading. Bake for 20 minutes. Loosen while the biscuits are still warm and then cool on trays. Enjoy with a glass of fresh milk or lemonade.